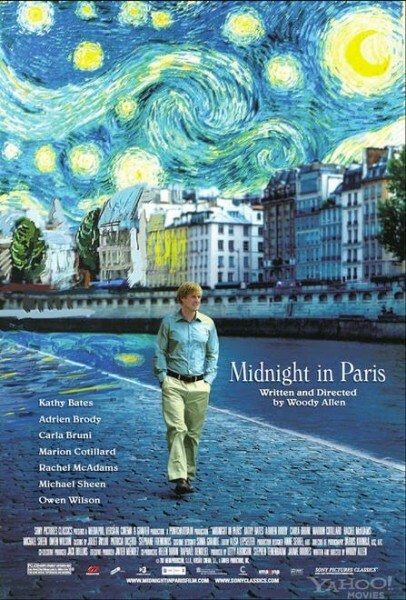 This year, Woody Allen's Midnight in Paris will be the opening feature at the Cannes Film Festival (May 11-22, 2011). Allen, originally born in Brooklyn, New York as Allan Stewart Konigsberg, continues his legacy of prolific film-making stamina. He's confessed to using his work to deflect any looming existential crises that may arise. Since the 50's, Allen has been writing, producing and at times starring in his own films--having released a movie every year within the last half century, (sometimes even multiple times a year). The infamous director, once-synonymous with being a fixture of New York City culture has recently become an expat filmmaker. Admittedly on the director's behalf for financial practicalities, Allen is making his rounds all around Europe. In fact, except for the quick and painful glitch of Whatever Works, a script Allen had written back in the 70's--making it into fruition in 2009, (which we must admit, after having seen it, we wished it would've stayed in the film writer's drawer-of-scripts-never-made...), Allen's last movie that really titillated the film palette as Woody Allen only could, was Melinda and Melinda, which came out about seven years ago. It starred Chloë Sevigny, Radha Mitchell, Will Ferrel, and with New York as its leading star of course. Allen has since jumped over the Atlantic Ocean to produce his yearly films--releasing Match Point (2005), Scoop (2006), and Cassandra's Dream (2007), You Will Meet a Dark Stranger (2010)--all filmed in England. And sandwiched in between, Vicky Cristina Barcelona (2009)--perhaps the only reminiscent of classic Woody for quite some time as of recent--filmed in unfamiliar territory, Spain, for which Penelope Cruz won an Oscar for Best Supporting Actress role. This year, Midnight in Paris (set in Paris of course) in true Woody Allen form, gathers an ensemble of deliciously compelling actors--with the likes of Carla Bruni (perhaps taking a risk as France's First Lady--participating in the film), Owen Wilson, Rachel McAdams, Kathy Bates, Adrien Brody and Marion Cotillard. With a cast such as this, it's difficult to imagine the film flapping at all--if not for the very excitement of seeing these actors play together. But what we're really hoping for is much more than that. We're hoping to see some classic: when Annie met Alvy, or some deconstructing Harry, or perhaps to have Allen narrate the film, (which we now realize was instrumental to his storytelling). Ok, yes, perhaps the last bit is indeed asking for too much. But lately, Allen's films have solely been dominated by deception and betrayal alone--leaving one with a bad taste in ones movie going mouth, particularly when the moral of the story is absent, and when the character growth is simply lacking. So Mr. Allen, if you're listening, we understand that there's this pesky theme of deception that your psyche is still trying to work out--at least that's what your shrink would say--but please do consider a return to appealing to the intellect, to highlighting the convoluted truths, the philosophical narratives that you yourself use to take us through, and dare we say it: please stop trying to deflect the looming existential crisis you've been trying to avoid in your recent films. It's what made them brilliantly relevant and with just the right dose of self-reflection--even if it's just for a couple of hours. Midnight in Paris will launch at Cannes on May 11, 2011. And it will be out in selected theaters in U.S. on May 20, 2011. Please check your local listings.